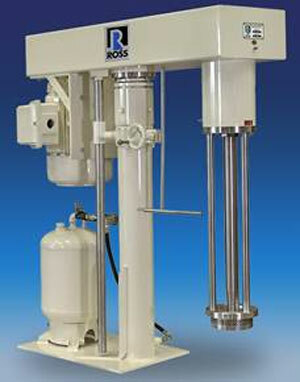 The Ross PreMax is an ultra-high shear mixer featuring the patented "Delta" rotor/stator assembly. The unique geometry of the Delta rotor/stator generator produces a double vortex that draws batch material from both the top and bottom of the mix chamber, accelerating dispersion and producing rapid turnover rates. Running at a maximum tip speed of 5,000 fpm, the PreMax handles viscosities up to 50,000 cP. Compared to other batch style mixers including high speed dispersers, traditional rotor/stator mixers and immersion mills, the PreMax delivers more superior particle size reduction. Based on side-by-side tests, it can finish viscous emulsions up to six times faster than ordinary high shear mixers. Sample applications include pigment dispersions, cosmetic creams, specialty coatings, ceramic slurries, flavor emulsions, polymer suspensions, gum solutions, etc. Many standard models are available for laboratory batches as small as 1-2 gallons and production vessels up to 1,000 gallons or larger. To schedule a mixing simulation test on the PreMax using your own raw materials or to take advantage of our trial/rental program, call 1-800-243-ROSS(7677).